Over the last three decades, ethnic Kayan people have fled conflict in Myanmar’s Kayah State and sought refuge in Mae Hong Son, Thailand. 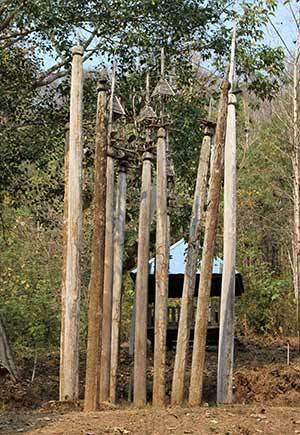 Today, many live in the riverside village of Huay Pu Keng on the Thai border with Myanmar. 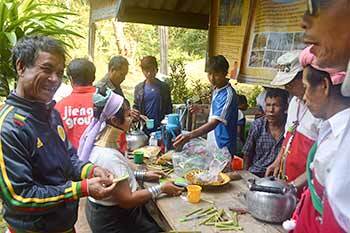 Homegrown organizations like Kayan Community Development Services (KCDS) ensure that community cohesion remains a priority in Huay Pu Keng as villagers rebuild their lives in exile. 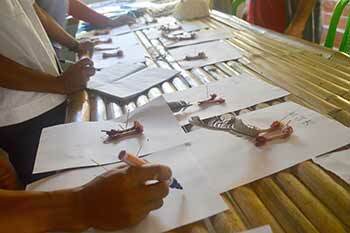 In addition to supporting education for youth, Partners Asia helps with cultural preservation. For communities fractured by conflict and migration, keeping traditions intact builds resilience. 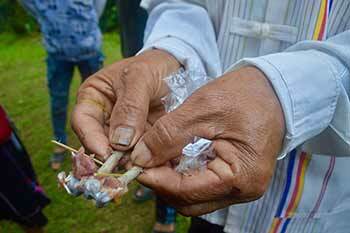 To do this, KCDS brought in Kaisu, a 41-year-old man from Kayah State who describes himself as “a man learned in animism.” From January 28-30, around 35 participants young and old gathered in a leafy-roofed open-air pavilion in Huay Pu Keng to revive old skills that they fear are being lost. The highlight of the workshop was a tutorial in the “reading” of chicken bones, a practice long used to make auspicious predictions of the future. Knowledge of these traditions is fast disappearing for ethnic groups throughout Myanmar as animists convert to other faiths, and as communities are distanced from one another due to ongoing conflict in the country. “We want to show other people that we still exist,” the trainer, Kaisu, said of animists, a religious minority who make up an estimated 1 percent or less of Myanmar’s population. The biggest challenge to delivering animist education is funding, he explained, pointing out that in any village, “the poorest families will be animist.” It is very rare for donors or patrons to invest in maintaining traditions unique to animist communities. 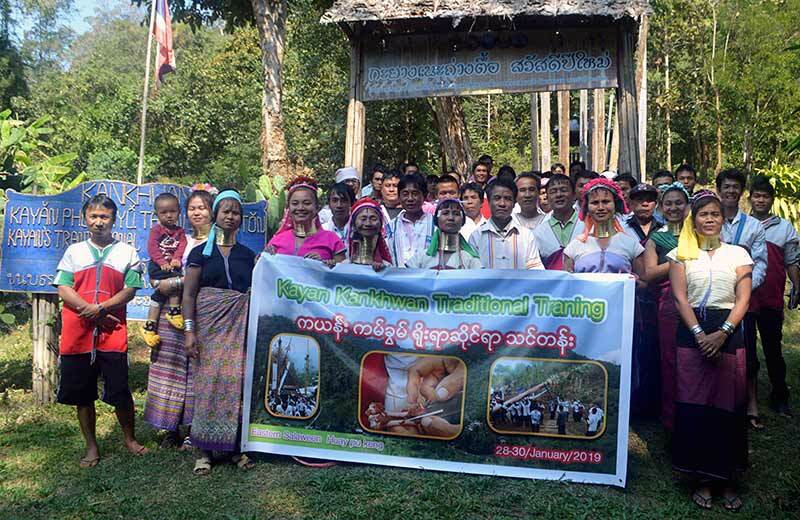 In sponsoring this training, Partners Asia is proud to support KCDS and the people of Huay Pu Keng in maintaining ties to the Kayan culture and to their homeland. It is important to understand the additional value of this activity for rebuilding community which has been so fractured by conflict and migration. A chicken bone reading is done to answer a specific question about the future. It involves identifying tiny holes in the bone, placing small sticks in these holes. The pattern and direction of the sticks are interpreted to answer the question. Before examining any actual bones, training participants were given “practice bones,” or papaya vines poked with toothpicks to represent different readings. Participants worked in pairs and small groups to interpret these. 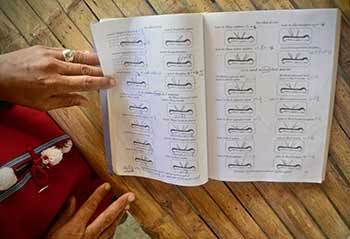 On the third and final day of the training, participants read actual bones for the first time. This pair of bones exemplified a positive reading—note the symmetry of the sticks poked into the tiny holes. The methodology in teaching chicken bone reading was similar to that of teacher training courses for language learning: present new information, practice it through a controlled activity, and finally, use the new knowledge freely. By putting all the bones on display, the training concluded with a review of and reflection on what was learned.